We have stressed the importance of knitting a tension swatch before starting work. 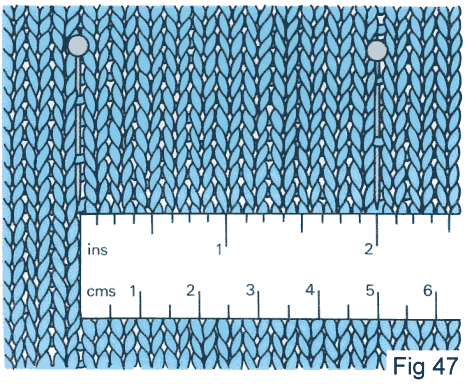 If the tension quoted is, for example, “22 stitches and 30 rows = 10 cms square measured over stocking stitch on 4 mm needles”, you have to produce a fabric made up of that number of stitches and rows regardless of the needle size you use. The needle size indicated on the pattern is the one most knitters will use to achieve this tension, but it is the tension that is important, not the needle size. The instructions given in the tension paragraph of a knitting pattern are either for working in stocking stitch or pattern stitch. If they are given in pattern stitch, you must work a multiple of stitches the same as the multiple required in the pattern. If the instructions are given in stocking stitch, any number can be cast on but whichever method is used, it should always be enough to give at least two extra stitches each side, as the edges of a knitting sample will curl and not give an accurate measurement. Work in pattern or stocking stitch, casting on the number of stitches given in the tension paragraph, plus 4 (i.e. 26 stitches) and work 34 rows or 4 rows more than the number stated. Break the yarn about 15 cms from the work, thread this end through the stitches, and then remove the knitting needle. Place a pin vertically into the fabric 2 stitches from one side edge. Measure 10 cms exactly and insert a second pin (Fig.47 - Note: diagram shows only 5 cms). Count the stitches. On stocking stitch, each loop represents one stitch. If the number of stitches between the pins is less than that specified in the pattern (even by half a stitch), your garment will be too large. Change to smaller needles and knit another tension sample. If your sample has more stitches over 10 cms, the garment will be too small. Change to larger needles. 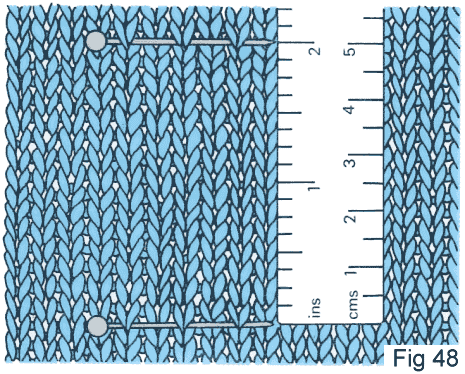 Check the number of rows knitted against the given tension also (Fig.48). Tension samples should never be measured on the needles because the needle distorts the fabric.